- Before heading to Burmecia itself, check along the mountain range where you just emerged, specifically to the north. You'll find a gate that would normally lead east. You'll hit a short cut scene upon entering the area, and though it's a dead end you can find a Tent and a Hi-Potion sitting beside the gate. - Burmecia is to the north, past exit and gate. Save out front, and make sure your team is healed up. 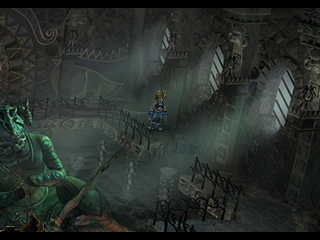 Though it's a city, Burmecia is also a dungeon. - Cut scene. Once it's done, head north through the streets of Burmecia. There's an overturned cart on your left as you run; check behind it for the Cancer Stellazzio. - Head north until you see Zorn and Thorn. 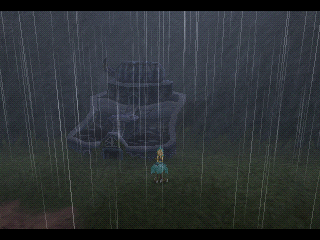 After a Black Mage battle you'll wind up outside a large, partially-ruined building. Go up the stairs in the far right and you'll find a two-floor interior; inside you can find a Soft on the lower floor and a Mimic battle on the upper floor. Go through the door on the upper floor and head west one screen to find a chest containing Germinas Boots. You'll pass a giant, regal-looking door on the way; mind it for later. - Crossing back from the Germinas Boots will drop a section of floor one level. Head back to the front of the building and enter the door on the left of the rubble pile. You can grab a Soft and a Potion from chests on the lower floor of this second building, as well as get at a Mimic on the second floor, via the floor that dropped down. - Go through the door near this second Mimic and you can jump from one balcony to another. Beyond the second balcony is a bedroom with a live soldier; he'll tell you to grab a Protection Bell, found beneath the rearmost bed in the room. You can find an Ether directly left of the bed, as well. - Return to the upper floors of these buildings, to that door you bypassed earlier. The Protection Bell will open this door, and after a cut scene within you'll wind up outside Burmecia's palace. Check in the first door you see, on the ground floor, for a cut scene with a soldier named Kal. He'll tell you to see him in Lindblum; remember this for later. - Go up the right stairs on the front of the palace and cross the fallen statue to the door on the left. There are two chests immediately inside; one has a Phoenix Down, the other a Tent. Head north and cross to the opposite side of the balcony to find a Mimic, or ignore it and go through the rear door. - You'll emerge into a courtyard. If you enter the door in the northwest you'll find a cut scene where Freya receives a Mythril Spear. - If you enter the door in the northeast you'll find a Moogle named Atla, to whom you can (potentially) deliver a letter from Mogki. He'll give you a Kupo Nut for delivering the letter, and will ask you to take a letter to Monev. You can also make purchases from Atla, including some useful equipment. Check the chest in the rear of the small room for a Lightning Staff. This will trigger the Moogle Stiltzkin to enter, and if you purchase a Soft, a Hi-Potion, and an Ether from Stiltzkin for 333 gil he'll be allowed to keep journeying. - Leave the courtyard and head north. After some cut scenes you'll hit a battle. A very, very dangerous battle. Beatrix is an opponent you can't actually beat. She uses powerful Sword Arts moves, more advanced than Steiner's, and has a move called Shock that will just straight-up kill one of your characters when used. She has no particular weaknesses, so all you can really do is heal as necessary and beat her down. Beatrix will end the battle in her favour if you manage to deplete or health or survive ten turns. 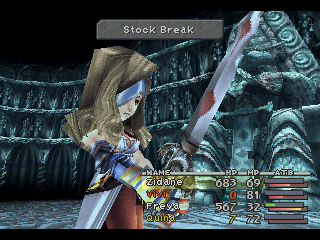 Zidane can Steal a Phoenix Down, a Chain Shirt, and, very, very rarely, a Mythril Sword from Beatrix.